ClinicalKey Description of this database. 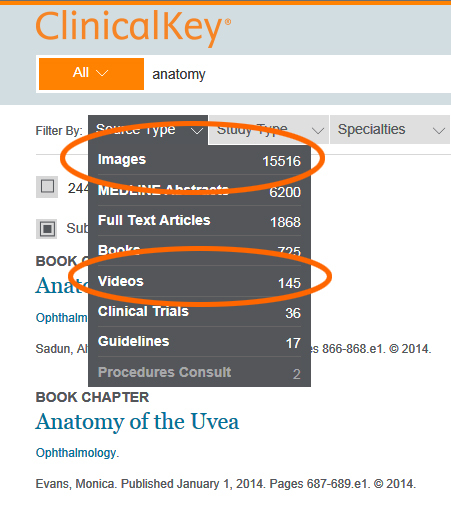 ClinicalKey has an impressive collection of image and video content. Search for your topic of interest, and then limit the Source Type to Images or Videos. If your interested in surgical procedures specifically, or mapping out the anatomy of a surgical procedure, you should also consider Procedures Consult - a collection of surgical procedure videos. "When you find images in ClinicalKey that you’d like to use in a presentation, you can save them for later use without leaving the results page. Images can be dragged and dropped from the search results list into Presentation Maker, or saved using the “Add to Presentation” button. You can also view, move and delete content within the Presentation Maker panel. The Presentation Maker will automatically insert citation information for you." Authorized DMU users of ClinicalKey have permission to use content from the site in presentations for noncommercial use. You do not need to incorporate the CK template into your Power Point presentation, but please remember to insert the proper citation information for the image within your course materials.